Oh, the joy of seeking out a good bottle of wine. Orange Coast Winery wine club has a new twist on the wine club concept and we tested it for the first time on a recent Friday night. Most wineries won’t empower you to choose wine for your shipment. Instead, they’ll ship a collection of wines they choose from their warehouse. This means you sometime receive mediocre wine, sometimes you receive great wine. But there are times you receive whatever they had in the back and haven’t been able to sell. They’ll clear out inventory and have a sale, and you’re paying ‘club price’ for wine they cannot move. 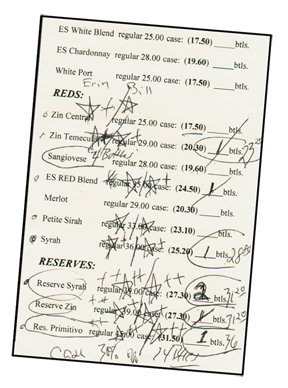 Our wine tasting notes and rankings. So it’s interesting to note two wineries in Orange County have moved to a flat fee wine club. Pay your quarterly fee, wander on down to the tasting room and sample their wines. Then, imagine you’re King Harrod and command the staff to bring your choices, enjoying the fruits of your power. You walk out the door with wine you really enjoy, not the vino Harrod would deem suitable for servants. It’s a little risky for the club because they cannot liquidate unpopular wine vintages that don’t sell. But it does give them direct feedback on consumer preferences and offers them cash flow. It has obvious challenges with out of area subscribers, but I’m sure the winery can handle this and make selections for out-of-towners. The other club using this model is Laguna Canyon Winery. We selected four bottles of wine, one Syrah, two Reserve Syrah and one Reserve Primitivo (all Lodi grape) and left with a $7 credit for the next cycle. We did enjoy much of their wine, and gave one Temecula wine good marks. Our only regret was their inventory of Sangiovese was down to the last four bottles. If you wanted to buy one you could, but you couldn’t taste it. This entry was posted in Blend, Lodi AVA - Home to 80 Wineries, Paso Robles AVA, Petit Sirah, Primitivo, Sangiovese, Southern California, The Pleasures of Tasting Wine, Zinfandel and tagged bottle of wine, california, lodi, orange couty, wine tasting room, wineries. What an awesome idea! It is so refreshing to see a company doing something so obviously consumer focused. This is really great for those of us who aren’t terribly familiar with wine but want to explore. No I’m not stuck with bottles I hate; I know I’m getting something I like! We love that you love our club! Stop in soon and check out some of our new club changes! No more 6 bottle allocation, just the requirement that the total credit be used all in one visit. We also have a whole new inventory of wine and Sangiovese! Hope to see you soon, and thank you for featuring us and our club!